Tomorrow, Nov 20th, to kick off the last leg of The 20/20 Experience World Tour, we are dedicating the day to The Ultimate #JT2020Tour Finale Giveaway for you, the fans!!!!! A Meet & Greet with JT before the show!!!! * NO PURCHASE OR PAYMENT OF ANY KIND IS NECESSARY TO ENTER OR WIN THIS GIVEAWAY! *ALL PRIZING SUBJECT TO CHANGE. * WINNERS MUST SHOW PROOF OF AGE/PICTURE ID AND SIGN A WINNER AFFIDAVIT OF ELIGIBILITY/ PRIZE ACCEPTANCE AGREEMENT AND AGREE TO THE TERMS AND CONDITIONS TO ACCEPT PRIZE. GUEST OF WINNER MUST SIGN GUEST RELEASE. Stay tuned tomorrow AM to Justin’s Instagram for more! Special thanks to Live Nation, MGM, MasterCard, and Sauza 901 for their support! NO PURCHASE NECESSARY TO ENTER OR WIN A PRIZE IN THIS SWEEPSTAKES. A PURCHASE WILL NOT INCREASE YOUR CHANCES OF WINNING. VOID WHERE PROHIBITED BY LAW AND IN ALASKA AND HAWAII. · YOU MUST VIEW THE INVITATION POST (DEFINED BELOW) TO PARTICIPATE. · BY TAKING ANY ACTION RELATED TO PARTICIPATING, YOU AGREE TO THESE OFFICIAL RULES, IN WHICH YOU GRANT RIGHTS TO RECORD YOU AND USE YOUR NAME AND LIKENESS AND YOU AGREE TO INDEMNITIES AND A LIMITATION OF LIABILITY, ALL AS MORE FULLY DESCRIBED BELOW. · WINNERS WILL BE REQUIRED TO SHOW VALID GOVERNMENT-ISSUED IDENTIFICATION AND READ, SIGN, AND AGREE TO WINNER DOCUMENTATION WITHIN TWENTY-FOUR (24) HOURS AFTER HE OR SHE LOCATES THE PRIZE, OR THE PRIZE WILL BE AUTOMATICALLY FORFEITED (IN SPONSOR’S SOLE DISCRETION). WINNER AFFIDAVIT OF ELIGIBILITY/LIABILITY AND PUBLICITY RELEASE AND GUEST LIABILITY AND PUBLICITY RELEASE MUST BE SCANNED AND EMAILED TO: [email protected]. · WINNER MUST TRAVEL FROM SPONSOR-SELECTED AIRPORT ON SPONSOR-SELECTED DATES ON OR AROUND JANUARY 2, 2015, OR PRIZE WILL BE FORFEITED. · THIS SWEEPSTAKES IS IN NO WAY SPONSORED, ENDORSED OR ADMINISTERED BY, OR ASSOCIATED WITH INSTAGRAM, LLC (“INSTAGRAM”) FACEBOOK, LLC ("FACEBOOK"), or TWITTER, LLC ("TWITTER"). The Ultimate #JT2020Tour Finale Giveaway (“Sweepstakes”) is sponsored by Tennman Digital (who, together with Justin Timberlake and each of their representatives are collectively referred to in these Official Rules as “Sponsor”). The Sweepstakes begins on November 20, 2014 at the time that Sponsor’s Invitation Post (defined below) is available publicly via Justin Timberlake’s account on Instagram and ends the earlier of either the time that the first potential winner locates the Prize Elements (defined below) or three (3) hours after the Invitation Post is available publicly (“Sweepstakes Period”). After viewing the Invitation Post, eligible participants (see eligibility requirements below) may participate in the Sweepstakes during the Sweepstakes Period by taking steps to find the Prize Elements shown or described in the Invitation Post. The first person identified by Sponsor’s representative to arrive at and claim the Prize Elements is the winner, as more fully described below and subject to verification by Sponsor’s representative. This Sweepstakes is open only to individuals who are legal residents of any one (1) of the forty-eight (48) contiguous United States or the District of Columbia, who are at least twenty-one (21) years old and who have personally viewed the Invitation Post, which may require Internet access. Each individual is eligible to win only one prize package and may only attempt to find the Prize Elements related to one Invitation Post. Attempts made to find a second or more Prize Packages associate with more than one Invitation Post are automatically void. Corporate entities are not eligible and have no right to claim any prize won by its employees. Sponsor, as well as employees, officers, directors, members, managers, agents, and representatives of Instagram or Sponsor’s advertising, promotion, public relations, fulfillment and marketing agencies (collectively, with Sponsor, the “Sweepstakes Entities”) and members of their immediate families and individuals living in the same household as such individuals, are not eligible. For the purposes of this Sweepstakes, immediate family members are defined as spouse, partner, mother, father, legal guardian, in-laws, grandmother, grandfather, brother, sister, children and grandchildren. Eligible individuals may participate in the Sweepstakes by viewing Sponsor’s post inviting people to locate certain select prize elements from the prize package described below (“Prize Elements”) in a public place (the “Invitation Post”), and then following the clue(s) and instruction(s) in the Invitation Post to attempt to physically find and arrive at the Prize Elements. Sponsor’s representative will be present with the Prize Elements and will determine in his or her sole discretion the order in which potential winners arrive at and attempt to claim the Prize Elements. The first person identified by Sponsor’s representative to arrive at and claim the Prize Elements is the winner, subject to verification by Sponsor’s representative. Sponsor may make several Invitation Posts, each to find Prize Elements in a different city. Only one (1) winner may win the prize package for each Invitation Post. No admission fees or other costs are required to find the Prize Elements. Sponsor is not responsible for and each participant waives the right to make any claim related to any fee, cost, or other expense that he or she may choose to make in connection with attempting to or actually finding the Prize Elements, regardless of whether he or she is determined to be or verified as the winner. As a condition of participating, each participant agrees that the decisions of Sponsor (including, without limitation, their representatives) are final and binding in all matters related to the Sweepstakes, including, without limitation, breaking any alleged or actual tie. In case of an alleged or actual tie, Sponsor’s representative may randomly select between the tied participants to determine the potential winner, subject to verification. Sponsor’s representative may request contact or other information from alternate potential winners in case one of the prior potential winners is not verified as the actual winner. Sponsor is not responsible if any individual refuses to or for any reason does not provide his or her contact information. Sponsor reserves the right to remove any comments to the Invitation Post in its sole discretion. Attempts made by an individual to participate in ways other than as described above or to use false contact information may be disqualified in Sponsor’s sole discretion. As a condition of participating in the Sweepstakes, each participant gives consent for Sponsor to obtain and deliver his or her name, address, and other information to third parties for the purpose of administering this Sweepstakes and complying with applicable laws, regulations, and rules. As a condition of participating in the Sweepstakes, each participant unconditionally accepts and agrees to comply with and abide by these Official Rules and the decisions of Sponsor, including the interpretation of these Official Rules and awarding of the prizes, which will be final and binding in all respects. Sponsor may at its sole discretion keep participant information for up to five (5) years after completion of the Sweepstakes for business management and record-keeping purposes. Participant agrees that his or her participation in the Sweepstakes and agreement to these Official Rules will not violate any agreement to which participant is a signatory or party. Sponsor reserves the right in its sole discretion to disqualify from the Sweepstakes any participant that publicly or otherwise behaves in any way that reflects negatively upon a Sweepstakes Entity, the Sweepstakes, or any other person or entity or does not comply with these Official Rules. To be verified as the winner, the potential winner must provide Sponsor’s representative with his or her government-issued identification and all required information, which may include full name, address, email address, telephone number (including area code) and all other required information. Each participant is required as a condition of entry to follow any and all requirements and instructions from Sponsor (including their representatives) to be eligible to win. The potential prize winner will, in Sponsor's sole discretion, be required to complete, sign, have notarized (if applicable), and return an Affidavit of Eligibility and Liability/Publicity Release (unless prohibited by law) and tax documents (collectively, “Winner Documents”), any or all of which may require the potential winner to provide his or her Social Security Number, at the time that he or she locates the Prize Elements (unless another time frame specified) and in the form provided by Sponsor, without revision, or prize will be forfeited in Sponsor’s sole discretion. The Winner Documents, if applicable, must be received by Sponsor from the potential winner by the deadline indicated, or prize may be forfeited and an alternate winner may be selected. Those who do not follow all instructions, provide all required information, or abide by these Official Rules will be disqualified. If during the prize fulfillment process, any Sweepstakes-related communication is returned as undeliverable, or if a selected potential winner cannot be reached or does not respond as instructed by Sponsor, that selected winner may be disqualified upon notice and an alternate winner may be selected (time permitting and in Sponsor’s sole discretion). Sponsor reserves the right to modify the winner selection and notification procedures in connection with the selection of any winner or alternate potential winner, if any. The entry, prize claim, and Winner Documents are subject to verification by Sponsor. Prizes legitimately claimed will be awarded. Sponsor will not be obligated to pursue more than three (3) alternate winners (time permitting) for any reason. Odds of winning depend upon the total number of participants and the speed at which the Prize Elements described or shown in each Invitation Post are found at the respective locations. One (1) winner per Invitation Post, subject to verification, will each receive a prize package, which consists solely of: an autographed vinyl version of Justine Timberlake’s album; one (1) Ultimate Swag Bag with merchandise selected in Sponsor’s sole discretion; two (2) tickets to the Justin Timberlake concert currently scheduled to take place on January 2, 2015 at the MGM Grand in Las Vegas, Nevada; two (2) tickets to the Sauza 901 VIP lounge for use on January 2, 2015; one (1) pass for winner’s and guest’s admission to the “meet-and-greet” event before the concert; two (2) round-trip, economy class airfare tickets from a Sponsor-selected airport near the winner’s residence in any one (1) of the forty-eight (48) contiguous United States or the District of Columbia to a Sponsor-selected airport in or near Las Vegas, Nevada; hotel accommodations (one (1) room based on double occupancy) for one (1) night at the MGM Grand Hotel and Casino; and, for the winner only, one (1) five hundred dollar ($500) MasterCard gift card. ARV of each prize package: $3258. If an Invitation Post is made for ten (10) different locations, then the total ARV for all prizes offered would be: $32,580. Actual retail value of the prize package may vary depending on the winner’s residence, market conditions, changes in value of components (e.g., airfare, hotel room rate) and other reasons. The Released Parties (defined below) are not responsible for and winner will not receive the difference between the actual value of the prize at the time of award and the stated ARV in these Official Rules or in any Sweepstakes-related correspondence or materials. Winner must travel from a Sponsor-selected airport near his or her residence within one (1) of the forty-eight (48) contiguous United States or the District of Columbia on Sponsor-approved dates currently scheduled to include January 2, 2015, or the prize may be forfeited and an alternate winner chosen if time permits. Failure to complete the trip prize does not relieve winner of his or her tax obligations associated with winning the trip prize. Specific travel arrangements and all prize details not specified in these Official Rules will be made and determined in Sponsor’s sole discretion. All tickets and gift cards are subject to additional terms and conditions imposed by their respective issuers. Travel must originate from and end at the same airport. Winner and his or her guest(s) must travel together on the same itinerary. It is the winner’s and his or her guest’s sole responsibility to comply with all travel requirements, which may include, without limitation, presenting necessary government-issued identification (including photograph) at the time of travel. Flight schedules are subject to change without notice. The Released Parties are not liable for any missed events or opportunities or expenses incurred as a consequence of flight cancellation/delay or ground transportation delay. Some restrictions may apply. Winner may be required to provide a credit card at time of hotel check-in to cover hotel incidentals. Winner’s guest must be at least twenty-one (21) years old. Winner agrees that his or her guest must comply with Sponsor’s and each prize provider’s procedures and policies and must complete, sign, have notarized and return a release of liability and, where legal, a publicity release to Sponsor in the timeframe specified by Sponsor or travel will not be allowed. Once selected by winner, guest cannot be changed without the express consent of Sponsor, which may be withheld for any reason. By entering this Sweepstakes and accepting the prize, winner agrees to maintain his or her behavior in accordance with all applicable laws and generally accepted social practices in connection with participation in any Sweepstakes or prize-related activity. Winner understands and agrees that Sponsor or prize providers have the right, in their sole discretion, to disqualify and remove winner or his or her guest from any activity at any time if the winner’s or his or her guest’s behavior is at any point uncooperative, disruptive, or may or does cause damage to person, property, or the reputation of Sponsor or otherwise violates the policies of the prize providers, and in such a case, such winner will still be solely responsible for all taxes and other expenses related to the prize. All federal, state and local taxes, as well as any expenses not specified in these Official Rules as being provided as part of the prize, are the sole responsibility of each winner. Sponsor is not responsible for and will not replace any lost, mutilated or stolen prize or any prize that is undeliverable or does not reach a winner because of incorrect or changed contact information. If winner does not accept or use the entire prize, the unaccepted or unused part of the prize will be forfeited and Sponsor will have no further obligation with respect to that prize or portion of the prize. Sponsor is not responsible for any inability of any winner to accept or use any prize (or portion thereof) for any reason. No transfers, prize substitutions or cash redemptions will be made, except at Sponsor’s sole discretion. Sponsor reserves the right to substitute the stated prize or portion thereof with another prize or portion thereof of equal or greater value for any reason, including, without limitation, prize unavailability. No more than the stated prizes will be awarded. Participants waive the right to assert as a cost of winning any prize, any and all costs of verification and redemption or travel to claim the prize and any liability and publicity which might arise from claiming or seeking to claim that prize. EACH PARTICIPANT AGREES TO RELEASE, HOLD HARMLESS AND INDEMNIFY THE SWEEPSTAKES ENTITIES AND THE RESPECTIVE OFFICERS, DIRECTORS, MEMBERS, MANAGERS, EMPLOYEES, REPRESENTATIVES AND AGENTS OF EACH (COLLECTIVELY “RELEASED PARTIES”) FOR ANY LIABILITY WHATSOEVER FOR INJURIES OR DAMAGES OF ANY KIND SUSTAINED IN CONNECTION WITH THE ACCEPTANCE, POSSESSION, USE, MISUSE OR AWARDING OF THE PRIZE, WHILE PREPARING FOR, PARTICIPATING IN AND/OR TRAVELING TO OR FROM ANY PRIZE- OR SWEEPSTAKES-RELATED ACTIVITY INCLUDING, WITHOUT LIMITATION, ANY INJURY, DAMAGE, DEATH, LOSS, OR ACCIDENT TO PERSON OR PROPERTY. WINNER AGREES THAT THE PRIZE IS PROVIDED AS-IS WITHOUT ANY WARRANTY, REPRESENTATION, OR GUARANTEE, EXPRESS OR IMPLIED, IN FACT OR IN LAW, WHETHER NOW KNOWN OR HEREINAFTER ENACTED, RELATIVE TO THE USE OR ENJOYMENT OF THE PRIZE, INCLUDING, WITHOUT LIMITATION, ITS QUALITY, MERCHANTABILITY, OR FITNESS FOR A PARTICULAR PURPOSE. FURTHER, THE RELEASED PARTIES ARE NOT RESPONSIBLE IN ANY WAY FOR ANY ADDITIONAL EXPENSES, OMISSIONS, DELAYS, OR RE-ROUTING RESULTING FROM ANY ACTS OF ANY GOVERNMENT OR AUTHORITY. WINNER ACKNOWLEDGES THAT HE/SHE IS SOLELY RESPONSIBLE FOR ANY ACTIONS, CLAIMS OR LIABILITIES OF HIS OR HER GUEST (IF ANY) RELATED TO ANY SWEEPSTAKES-RELATED ACTIVITY, INCLUDING, WITHOUT LIMITATION, ANY ACTIONS, CLAIMS OR LIABILITIES RELATED TO THE GUEST’S (IF ANY) USE OF THE PRIZE. Released Parties are not responsible and/or liable for any of the following, whether caused by a Released Party, the participant, or by human error: entries that are submitted by illegitimate means (such as, without limitation, by an automated computer program) or entries in excess of the stated limit; any lost, late, incomplete, illegible, garbled, mutilated, or misdirected entries, e-mail, mail, social media message, or Sweepstakes-related correspondence or materials or postage-due mail; any error, omission, interruption, defect or delay in transmission or communication; viruses or technical or mechanical malfunctions; interrupted or unavailable cable or satellite systems; errors, typos, or misprints in these Official Rules, in any Sweepstakes-related advertisements or other materials; failures of electronic equipment, computer hardware or software; lost or unavailable network connections, or failed, incorrect, incomplete, inaccurate, garbled or delayed electronic communications or entry information. Released Parties are not responsible for any changes or unavailability of the Instagram platform that may interfere with the Sweepstakes (including any limitations, any restrictions, or any conditions on Sponsor's ability to use the Instagram platform for the Sweepstakes as set forth herein that are not acceptable to Sponsor) or ability of participant to timely enter, receive notices or communicate with Sponsor, in which case Sponsor, in its sole discretion, may terminate or modify the Sweepstakes. Released Parties are not responsible for electronic communications that are undeliverable or do not reach participant as a result of any form of active or passive filtering of any kind, or insufficient space in a potential winner’s email, voicemail, or other inbox. Released Parties are not responsible, and may disqualify you, if your email address or other contact information does not work or is changed without prior written notice to Sponsor. Released Parties are not responsible, and may disqualify you, if your e-mail address or other contact information does not work or is changed without prior written notice to Sponsor. Without limiting any other provision in these Official Rules, Released Parties are not responsible or liable to any participant or winner or any person claiming through such participant or winner for failure to supply the prize or any part thereof in the event that any of the Sweepstakes activities or Released Parties’ operations or activities are affected, as determined by Sponsor in its sole discretion, including, without limitation, by reason of any acts of God, any action, regulation, order or request by any governmental or quasi-governmental entity (whether or not the action, regulations, order or request proves to be invalid), equipment failure, threatened terrorist acts, terrorist acts, air raid, blackout, act of public enemy, earthquake, war (declared or undeclared), fire, flood, epidemic, explosion, unusually severe weather, hurricane, embargo, labor dispute or strike (whether legal or illegal) labor or material shortage, transportation interruption of any kind, work slow-down, civil disturbance, insurrection, riot, or any law, rule, regulation, order or other action adopted or taken by any governmental, federal, state or local government authority, or any other cause, whether or not specifically mentioned above. By entering the Sweepstakes (except where prohibited by law), each participant grants the Sweepstakes Entities the irrevocable, sublicensable, absolute right and permission to use, publish, post or display his or her name, photograph, likeness, voice, prize information, biographical information, any quotes attributable to him or her and any other indicia of persona (regardless of whether altered, changed, modified, edited, used alone, or used with other material in the Released Parties’ sole discretion) for advertising, trade, promotional and publicity purposes without further obligation or compensation of any kind to him or her, anywhere, in any medium now known or hereafter discovered or devised (including, without limitation, on the Internet), world-wide, without any limitation of time and without notice, review or approval and each participant releases all Released Parties from any and all liability related thereto. Nothing contained in these Official Rules obligates Sponsor to make use of any of the rights granted herein and winner waives any right to inspect or approve any such use. Failure to comply with these Official Rules may result in disqualification from this Sweepstakes. Participants further agree to not damage or cause interruption of the Sweepstakes and/or prevent others from participating in the Sweepstakes. Sponsor reserves the right to disqualify any participant if any suspicious participation is detected. Sponsor reserves the right, in its sole discretion, to disqualify any participant who Sponsor believes has actually or attempted to tamper with or impair the administration, security, fairness or proper play of this Sweepstakes. Sponsor’s failure to or decision not to enforce any provision in these Official Rules will not constitute a waiver of that or any other provision. In the event there is an alleged or actual ambiguity, discrepancy or inconsistency between disclosures or other statements contained in any Sweepstakes-related materials and/or these Official Rules (including any alleged discrepancy or inconsistency in these Official Rules), it will be resolved in Sponsor’s sole discretion. Participants waive any right to claim ambiguity in the Promotion or these Official Rules. If Sponsor determines at any time in its sole discretion that the winner or potential winner is disqualified, ineligible, in violation of these Official Rules, or engaging in behavior that Sponsor deems obnoxious, inappropriate, threatening, illegal, violating any applicable policies, or that is intended to annoy, abuse, threaten, or harass any other person, Sponsor reserves the right to disqualify that winner or potential winner, even if the disqualified winner or potential winner may have been notified or displayed or announced anywhere. The Released Parties are not responsible and will have no liability for any participant who is removed from any physical place for any reason at any time, including prior to being acknowledged as the potential winner in the Sweepstakes. The invalidity or unenforceability of any provision of these Official Rules will not affect the validity or enforceability of any other provision. In the event that any provision is determined to be invalid or otherwise unenforceable or illegal, these Official Rules will otherwise remain in effect and will be construed in accordance with their terms as if the invalid or illegal provision were not contained herein. If the Sweepstakes is not capable of running as planned for any reason, Sponsor reserves the right, in its sole discretion, to cancel, modify or suspend the Sweepstakes. If any person supplies false or misleading information, participates by fraudulent means, or is otherwise determined to be in violation of these Official Rules in an attempt to obtain any prize, Sponsor may disqualify that person and seek damages from him or her and that person may be prosecuted to the full extent of the law. In the event of a dispute concerning the identity of a participant, the participant will be disqualified in Sponsor’s sole discretion. CAUTION: ANY ATTEMPT TO DAMAGE ANY ONLINE SERVICE OR WEBSITE OR TO UNDERMINE THE LEGITIMATE OPERATION OF THE SWEEPSTAKES VIOLATES CRIMINAL AND CIVIL LAWS. IF SUCH AN ATTEMPT IS MADE, SPONSOR MAY DISQUALIFY ANY PARTICIPANT MAKING SUCH ATTEMPT AND MAY SEEK DAMAGES TO THE FULLEST EXTENT PERMITTED BY LAW. Except where prohibited, as a condition of participating in this Sweepstakes, each participant agrees that any and all disputes that cannot be resolved between the participant and any Sweepstakes Entity, claims and causes of action arising out of or connected with this Sweepstakes, or the prize awarded, or the determination of the winner must be resolved individually, without resort to any form of class action. Further, in any such dispute, under no circumstances will an participant be permitted or entitled to obtain awards for, and hereby waives all rights to claim punitive, incidental or consequential damages, or any other damages, including attorneys’ fees, other than participant’s actual out-pocket expenses (if any), not to exceed ten U.S. dollars ($10 USD), and participant further waives all rights to have damages multiplied or increased. This Sweepstakes and any dispute arising under or related thereto (whether for breach of contract, tortious conduct or otherwise) will be governed by the laws of the State of California, without reference to its conflicts of law principles. Any legal actions, suits or proceedings related to this Sweepstakes (whether for breach of contract, tortious conduct or otherwise) will be brought exclusively in the state or federal courts located in Los Angeles, California, and each participant accepts and submits to the personal jurisdiction of those courts with respect to any legal actions, suits, or proceedings arising out of or related to this Sweepstakes. 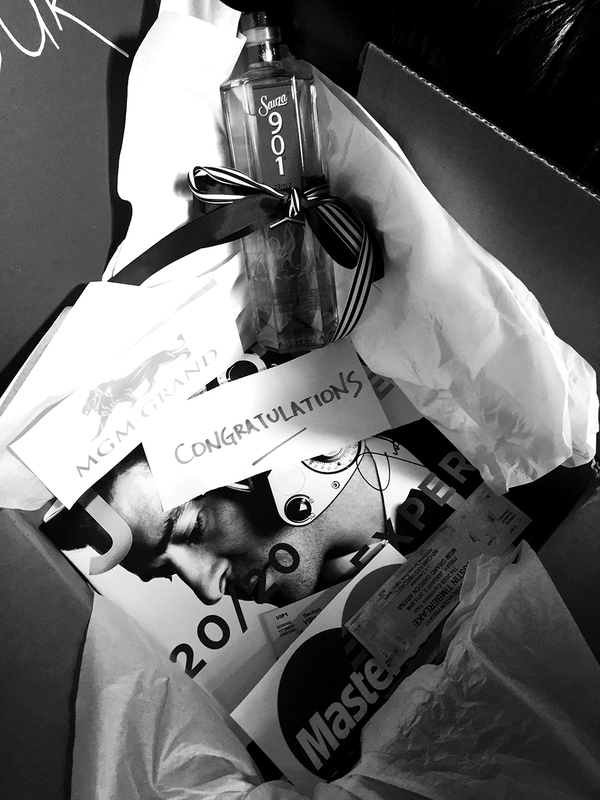 To find out who won, send a self-addressed stamped envelope to the following address within three (3) months of the end of the Sweepstakes Period: The Ultimate #JT2020Tour Finale Giveaway Winner’s List, Attn: Alicia Winfield Sydney, Ziffren Brittenham LLP, 1801 Century Park West, Los Angeles, CA 90067-6406. For a copy of these Official Rules during the Sweepstakes Period, visit www.justintimberlake.com/news/233073 or send a self-addressed stamped envelope to the following address for receipt during the Sweepstakes Period: The Ultimate #JT2020Tour Finale Giveaway Winner’s List, Attn: Alicia Winfield Sydney, Ziffren Brittenham LLP, 1801 Century Park West, Los Angeles, CA 90067-6406. Only one (1) request of either type per outer envelope will be fulfilled. Vermont residents may omit return postage for rules requests. THE SPONSOR OF THIS SWEEPSTAKES IS: Tennman Digital, c/o Ziffren Brittenham LLP, 1801 Century Park West, Los Angeles, CA 90067-6406. Just a perfect birthday gift ???????? I live in Vegas and going to the #JT2020Tour next Friday at the MGM. Wouldn't mind going again for New Years! My boyfriend JT! I love him! So kind hearted for doing this! I would love win! WOW! Greatest gift ever! Good luck JT fam! I live in Japan, but I'll go to see #JT2020Tour in LA next week. If I found the vinyl during LA stay, I can go to the concert once again!! I can't speak English and I can't go JT's tour now. But someday I hope to see JT's tour. I love you. Justin timberlake. ?